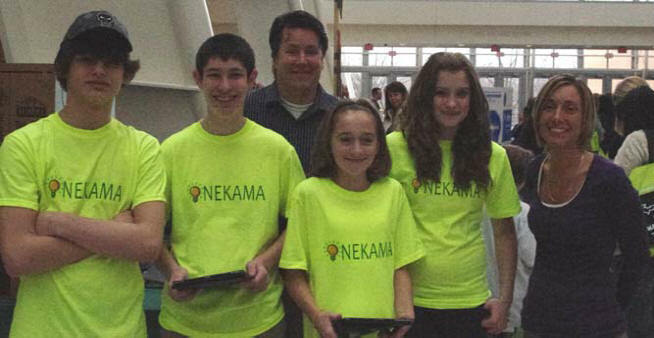 On Thursday, March 8, 2012, a group of eighth grade students and two teachers from Onekama Consolidated Schools traveled to Grand Rapids to present at the 2012 MEA/MACUL Student Technology Showcase. The Michigan Association for Computer Users in Learning (MACUL) is non-profit organization dedicated to bringing educators together to share their knowledge and concerns regarding educational uses of computers and technology. During the day-long Student Technology Showcase, teams of K-12 students are invited to help others see first-hand how technology is used in classrooms across Michigan. Presenting at the conference were students Alyssan Clarke, Emma Putney, Keith McKenney and Brandin Cromwell. They were accompanied by their English teacher, Nicole Torrey, and their history teacher, John Neph. Onekama Superintendent Kevin Hughes, Technology Director Bruce Peabody, board member Dennis Zupin, elementary teachers Jennifer Bromley and Ben Mauntler, and high school teacher Fayanette Pierce also attended in order to gather ideas to bring back to the school. The Onekama students were selected to present at the conference and share the ways technology has strengthened their curriculum. 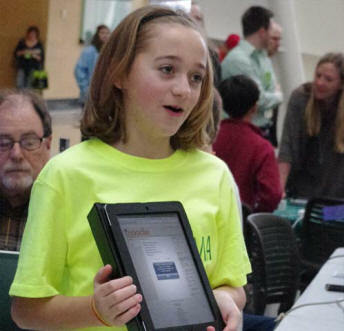 In past years, Onekama students demonstrated projects involving laptop computers and a variety of software. This school year, the students showcased the results of the school’s 70 iPad tablet computers, and the ways their teachers have used this technology to enhance student learning. Onekama eighth grade students created a cross-curricular project in collaboration with their English 8 and History 8 classes, which they incorporated into their MACUL presentation. Onekama teacher John Neph was impressed with the students’ speaking and presentation skills at the conference and appreciated the opportunity for his students to showcase their learning. 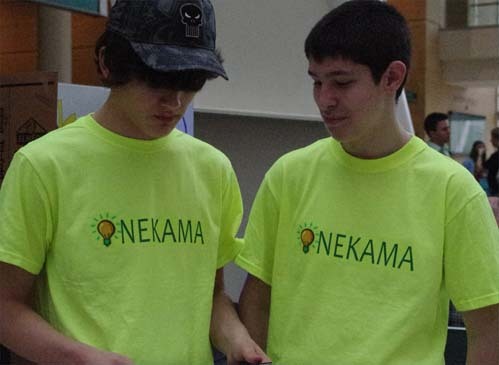 “Onekama School provides numerous opportunities for students to use technology every day, and as a result, our students are doing incredible things,” said Neph. Onekama eighth grade student Allyssan Clarke demonstrates how the iPad is used in her classes. created on the U.S. Constitution.